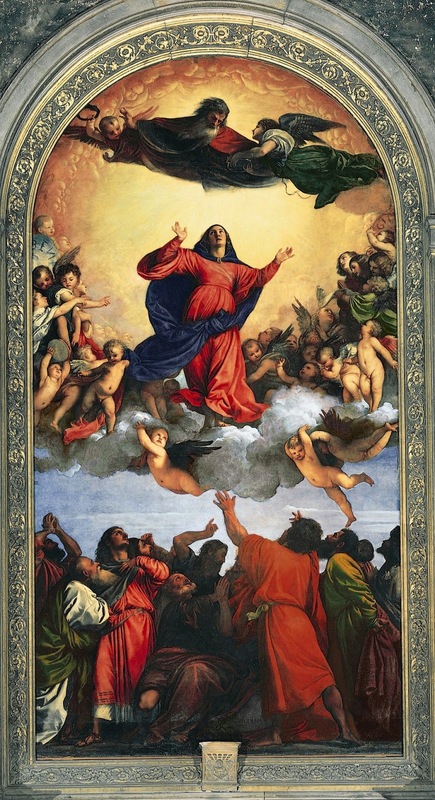 Titian’s huge altarpiece of the Assumption of Mary into Heaven is by far the most well-known and spectacular painting of that subject. 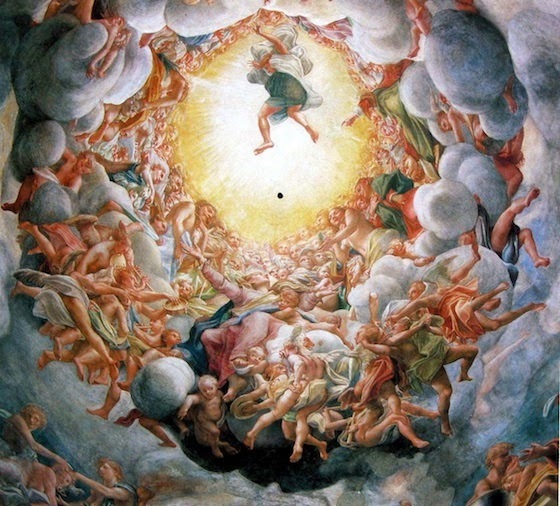 The painting is more than 22 feet high and 11 feet wide and was designed to fit behind the main altar of Santa Maria Gloriosa, commonly known as the Frari, in Venice. It still dominates the Frari, then as now the Franciscan center in Venice. 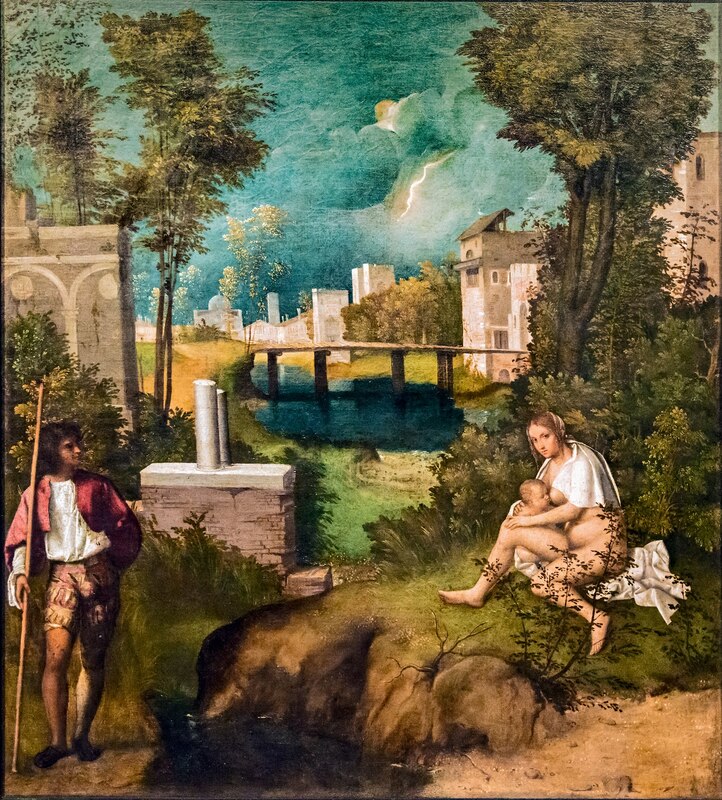 It was begun in 1516 and completed in 1518 and was a sign that Titian had become not only the premier painter in Venice but also, one of the greatest in Europe. However, Titian was only one of many Italian masters who turned their attention to this subject in the sixteenth century. To give one example, a few years later Correggio painted a kind of Baroque version in the cathedral of Parma. In the sixteenth century Titian and others would still retain the Apostles in the scene but would show Mary as a full grown beautiful woman rising up on her own to meet the Trinity. Her traditional red dress is a sign of her humanity, but the blue cloak that billows around her is a sign that she has been covered or cloaked by the Almighty. The primitive image of an infant in the arms of her Son would be discarded. I believe that the change must have reflected the increased interest in the idea of the Immaculate Conception that had been developing since the beginning of the fifteenth century. If Mary was conceived without original sin, then Mary would not, following the words of St. Paul, be subject to death. It was Sin that ushered Death into the world. Therefore, the Assumption of Mary is a corollary to the Immaculate Conception. Significant developments in the 15th century had brought the idea of the Immaculate Conception to prominence by the end of the century. In the first place, the century witnessed a continued increase in devotion to the Madonna, which naturally led to an increased interest on the part of the populace in the "Conception." This interest was fostered by religious orders, most notably the Franciscans. Secondly, controversy about the doctrine between the Franciscans and the Dominicans, the two great preaching orders, contributed to the development of the doctrine. In 1438 the Council of Basel, no doubt responding to the upsurge of devotion to Mary, affirmed the doctrine of the Immaculate Conception but only after Papal legates and others had left the Council. Without Papal support the Council and its decrees could not become binding on the Church. Nevertheless, the concept of the Immaculate Conception had been given tremendous impetus, especially in France and the Iberian peninsula. Nowhere, however, did it receive greater support than in Venice. Rona Goffen, in Piety and Patronage in Renaissance Venice, argued that Venice itself became identified with the Immaculate Conception by the end of the Quattrocento. [ii] By mid-century there were 20 churches and 300 altars dedicated to the Madonna. By the end of the century, churches like S. Maria dei Miracoli and S. Maria della Carita were dedicated specifically to the "Immaculata." In 1498, the Confraternity of the Immaculate Conception was founded in Venice, and it worshipped at the Frari's famous Pesaro altar, itself dedicated to the Immaculate Conception. The Papacy also played a role. Francesco della Rovere, the Vicar-General of the Franciscan order and a leading Franciscan scholar was elected Pope Sixtus IV in 1471. In the previous year he had written a treatise on the Immaculate Conception in which he had tried to reconcile the differing opinions of supporters and opponents. In 1476 he responded to increased rancor among the contending orders with a Bull calling for an end to the controversy. Subsequently, he added the feast of the Immaculate Conception to the liturgy for the entire Western Church, and ordered new offices to be composed for the Feast. One was even composed especially for Franciscan use. Nevertheless, the controversy continued and both sides intensified their efforts, especially in Venice where the Frari, became a virtual shrine to Mary's Immaculate Conception. [i] For a comprehensive discussion of the doctrine and the controversy surrounding it see The Dogma of the Immaculate Conception, History and Significance, ed. Edward Dennis O’Connor, University of Notre Dame Press, 1958, c. VI. See also the article on the Immaculate Conception in “The Catholic Encyclopedia,” 1910. [ii]Rona Goffen, Piety and Patronage in Renaissance Venice, Yale, 1986, p. 154. [iii]Goffen, op. cit. p. 79.